Hopefully, you have not had to deal with an insurance claim involving your Pride and Joy , race, show, collector, special interest or antique vehicle. If you have, I hope you had a professional appraisal done to establish a fair value on the vehicle. If you did not, I am sure you now wish you had. If you do not have an appraisal done, the chances are you will AT BEST, get ½ the value you should, and perhaps even less than that. I recently had occasion to do just this, and had professional auto appraiser John McBain come and appraise a few vehicles for me, one of which is the subject of debate with SGI Insurance. Despite all efforts to prove the value of the vehicle with comparisons, SGI chose to establish the value with that of the cheapest of the same vintage they could find, which made a difference of about $10,000.00. Had I taken care of this prior to the claim, there would be no real issue. I can not encourage you enough to GET THIS DONE NOW, before it is too late. I have known John for nearly 40 years, which is almost as long as he has been in the auto industry, providing general and hard to find parts to the drivers, builders and gear heads in Canada and focusing on the Saskatoon, Saskatchewan area. John himself is a collector and builder, so he knows what goes into putting together a car which makes him very qualified to establish a real accurate value for you. You ca not afford NOT to do this. 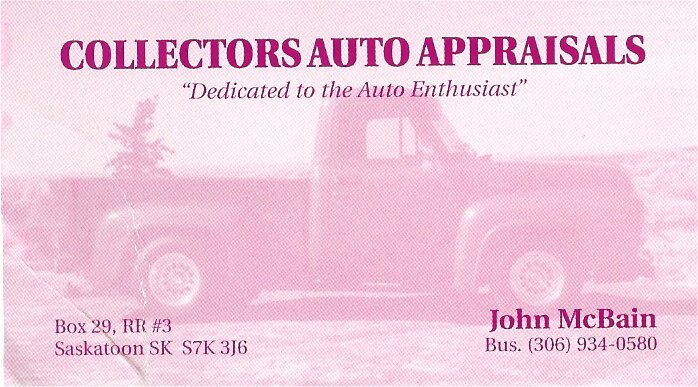 If you are not from around here, perhaps John can direct you to a professional appraiser near you. Failing that, contact a local car club for a referral.